Get notified when Fall Out Boy tickets are available! Fall Out Boy is a rock band that is a part of the pop punk, pop rock and alt rock genres. Founded in 2001, the band began playing in Wilmette, Illinois, outside of Chicago, and broke onto the scene with their first studio album Your Grave. 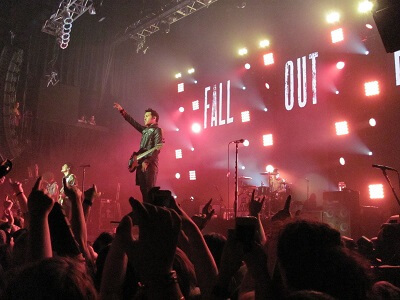 Current band members include Joe Trohman, Pete Wentz, Patrick Stump and Andy Hurley. Fall Out Boy has been very successful on the Billboard Charts and has sold millions of records. You can see them in concerts to hear and see them play hits like “Centuries,” “My Songs Know What You Did in the Dark,” “Rat a Tat” and “Immortals” by buying Fall Out Boy tickets online.